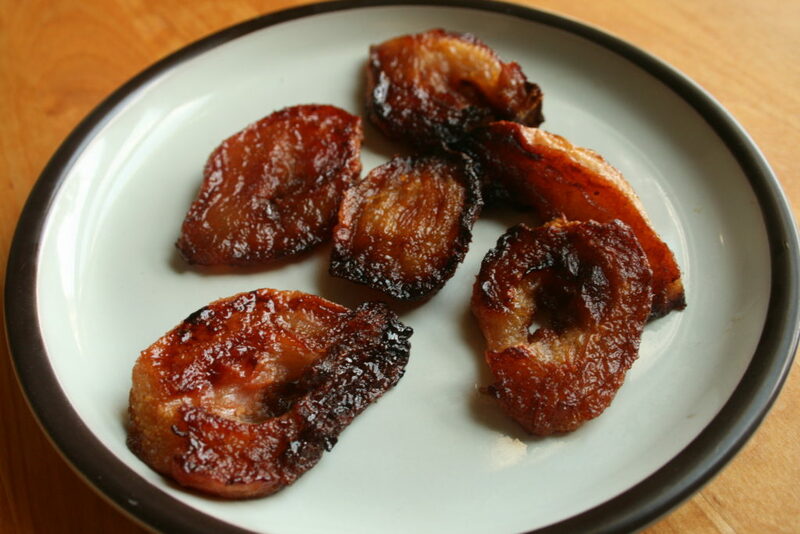 I don’t quite know how to put into words for you the deliciousness of these caramelized pears! This is officially one of those recipes that now holds ground in the family tradition category. It’s dessert worthy, but healthy enough to have as a snack, AND they freeze well with zero change in texture when thawed out. All the fruit-growers, food-preservers and dinner-hostesses rejoice! No more canning those pears in syrup. No more boiling them down into mush. When you need a last-minute dessert for your dinner company, you can now be proud to just reach for the freezer. When I tasted that unthawed morsel and they were as good as out of the oven, I knew my pear future was forever changed. You don’t have to have a whole tree to necessitate this recipe. Those store-bought gems will shine here, too. I have, though, been on a hunt for just the right method of preservation to have in my toolbox for the first big pear harvest of the tree we planted six years ago. Thanks to my neighbor’s tree, in years past I have canned pear butter and ginger-pear simple syrup, and I have frozen pear sauce. 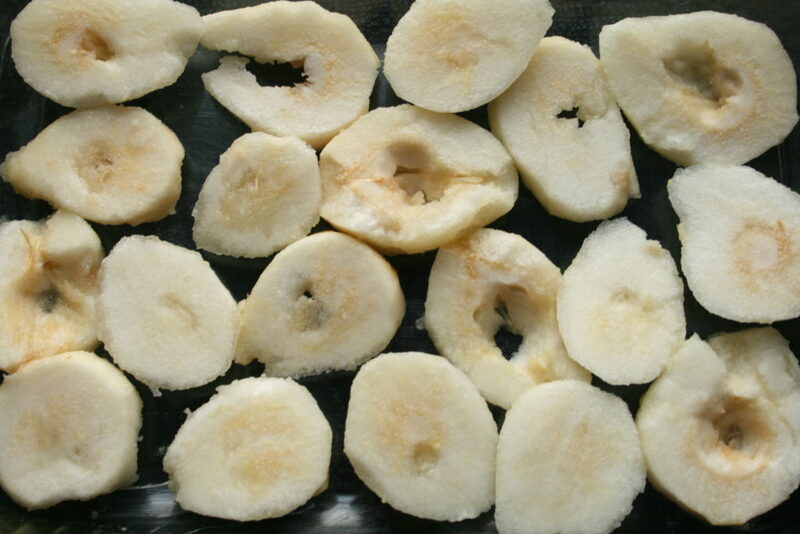 Leafing through food preservation books turned up many an unappealing recipe for canning pear slices in syrup. On occasion, I’ve come across a chutney. All the things I have made were ok, but nothing WOW, until now. These pears are decorated with butter, a touch of honey and brandy, then roasted in the oven to caramelize all that delicious into perfection. The final product has crispy edges with a deeply flavored center that is still soft, but now transformed into a warm, custard-like texture. They hold structure well enough to be wrapped up in a galette dough or topped with mascarpone, but are delicious enough that neither are needed. Not even a fork, thank you. The alcohol cooks off so these are kid safe, but you can omit the brandy if you wish, or even the honey. All that is absolutely necessary is good, ripe, but still semi-firm pears and a kiss of fat to dance with the natural sugars to create that magic caramel. The brandy and honey in my recipe is just an extra-indulgent flavor punch. Pear skins are very thin, so a good peeler as opposed to a paring knife is very much your friend. If you’re woefully frugal like me, freeze those skins for later whizzing into pear sauce, or adding to your next smoothy. They are sweet, just not the right texture for this recipe. 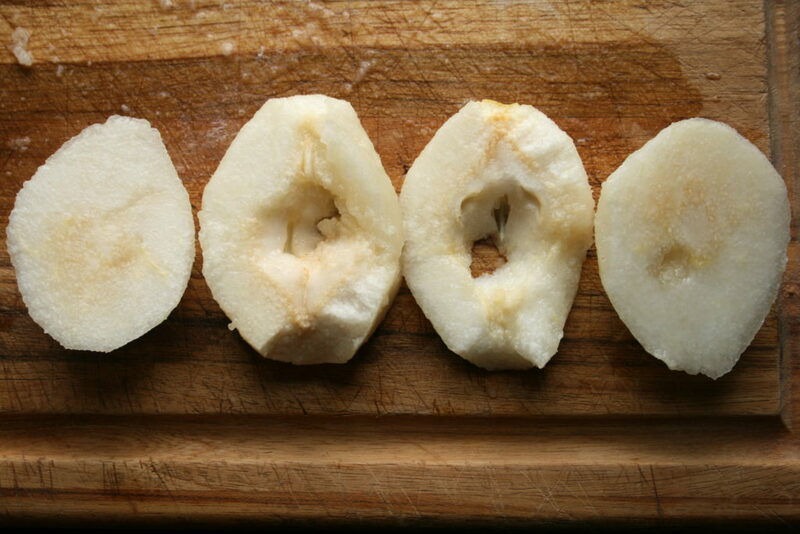 The core of a pear is not large and fibrous like an apple. There is no need to cut the entire mid section out. I like to cut the pear right down the center, and just gently pull the stem from one side, peeling it out as if it were a cheese stick. With a knife, slice the bottom knob off (scientifically referred to as a calyx, not a bottom knob). Last, dig out the few seeds in the center, while still leaving as much flesh as you can. I just use the point of my knife to fish them out; a spoon would be overkill. Next, slice each side in half again, like shown. These slices are approximately 1/4 inch thick. Choose a pan with edges, especially if you are adding the brandy. I find that two 9×13 pyrex pans fit perfectly side by side in my oven, though shallower pans with a little lip are fine, too. Butter your pan and lay the slices out with no overlapping. 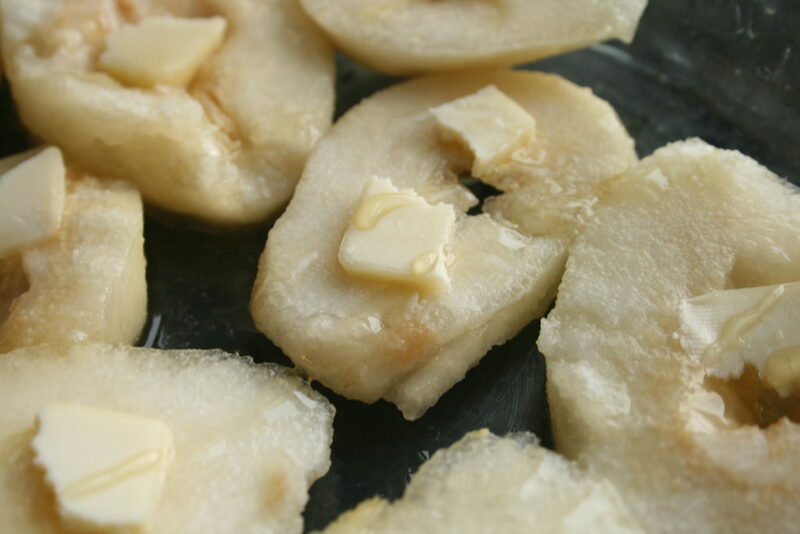 For this step, I like to have cold butter in the fridge that I just thinly slice and break into pieces to dot each pear. Next, splash some brandy on that fine bedding. Last, go back and forth across the pan with a very thin drizzle of honey. 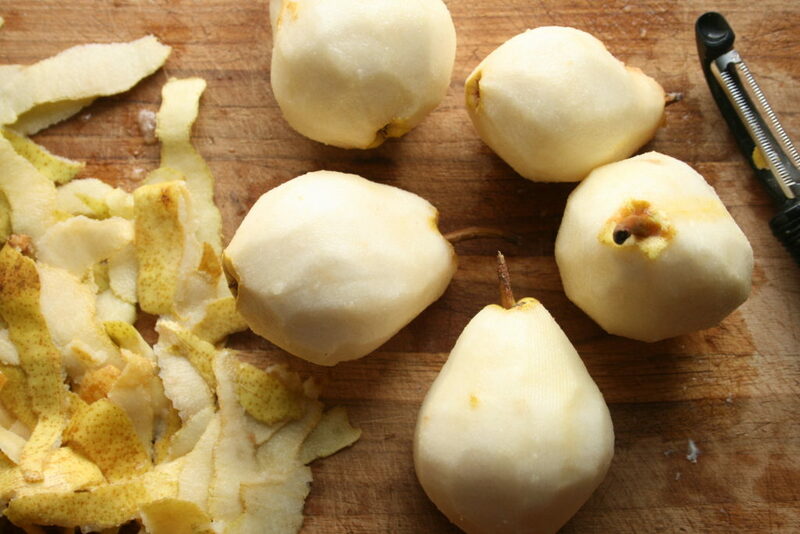 Pears are already very sweet, so no need to cover the slices with too much sweetness. Put the pan in the oven and just forget about it for a while. 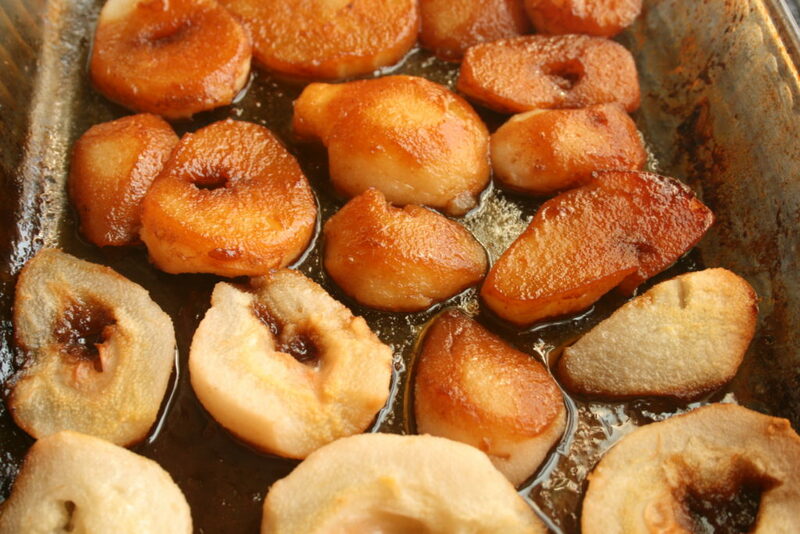 After 30 minutes, start peeking at the underside to see how caramelized your pears are becoming. You will not be able to tell this from the top side at all. 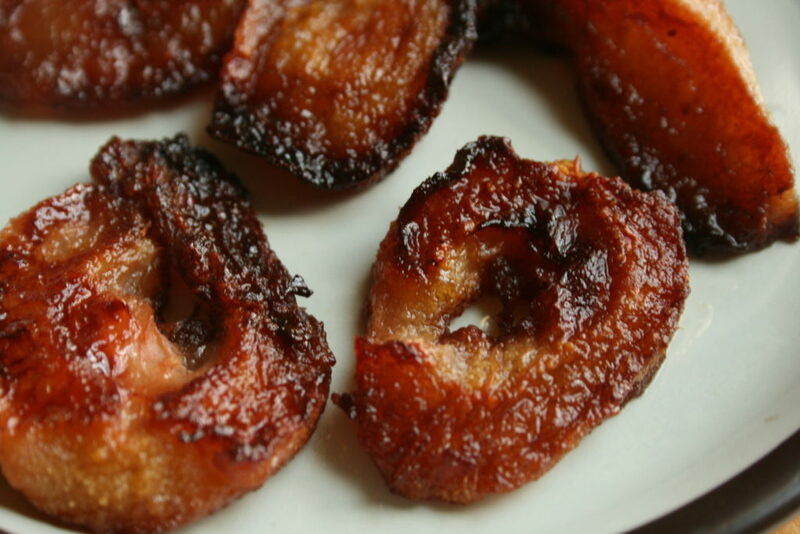 The top sides in the below photo’s foreground look hardly cooked, while the bottoms are actually caramelizing (background). This is the point at which I flip my pears. You could go a little longer, especially that middle pear that was thicker than the others, but if you go too long on the first side, they could burn during the second side’s cooking. Cooking on the second side will allow for the development of that crispier edge on, I promise. Mine took roughly 40 minutes on each side to be done. In this photo, the pears are considered done. Again, you must check the underside to assess the doneness. 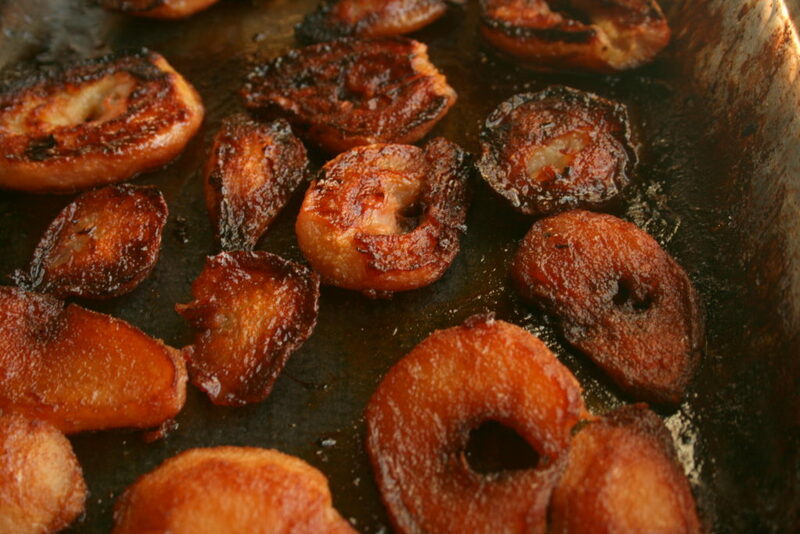 The tops (in the foreground) will look more or less the same, while the underside has deep caramelization going on. There’s really no right or wrong here; it’s preference. 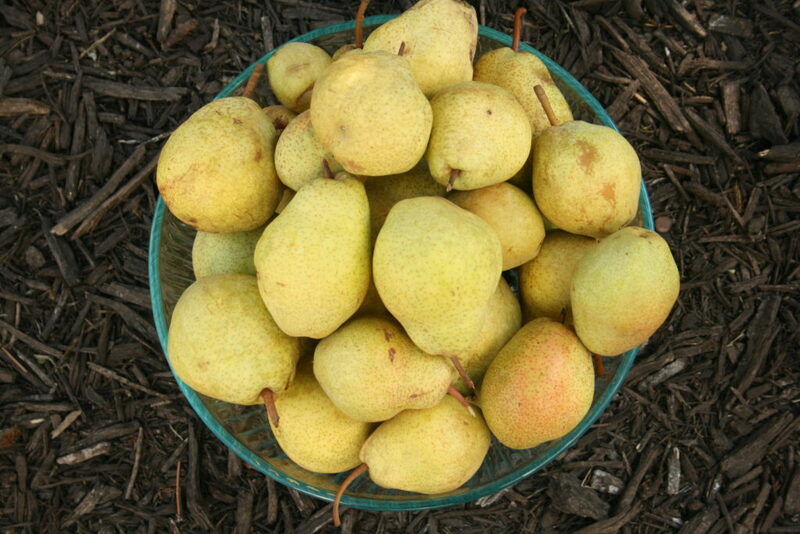 If you have more pears, transfer to a plate to cool and continue with the next batch. You best hide the plate, though, or your kitchen traffic will grab those right up! I take a couple, too. They are so irresistible when warm from the oven. Once they have cooled, I like to lay them out on a tray, with no overlapping, and pop in the freezer so they freeze individually. Once they are frozen, I remove the tray, and transfer to a larger freezer container for storage. This extra step inevitably ends up costing a pear slice or two 😉 Irresistible, I tell you! What are you preserving right now? Try this treat out and let me know what you think in the comments!